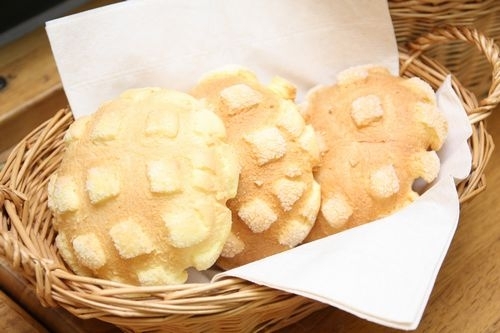 There used to be a truck that came by each Friday and parked by our local train station, offering dozens of varieties of my favourite baked treat - melon pan. This combination of cookie + bread was created in the image of a rock melon, and ever so occasionally even have a melon taste! Melon pan are pretty old hat, but the Beikudo truck - which makes its rounds along various cities in northeast Osaka - was really something special. They would have the bread warming in the ovens in there, for one thing, and the selection was amazing. My friend Shelley and I routinely picked up half a dozen or more from Beikudo to bring home for the weekend - it was our "TGIF" ritual. 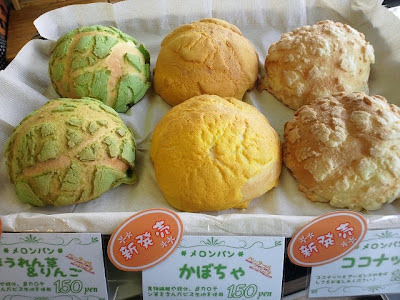 If it was seasonal, there would be a melon pan flavour for it. How I miss Beikudo! Now that I'm home, melon pan is very tough to find in Toronto. I've never seen any variety except plain, and they also dry out so fast that if you arrive at J-Town's Nakamura Bakery by day's end (if there are even any left), they aren't half as good. Melon pan are meant to be soft, and while I sometimes kept my Beikudo purchases to last through the weekend - and even mailed a boxful packed in Tupperware to a friend in Canada! - I find Nakamura's have reached their life by the next morning. Very unfortunate. If you're interested in trying to make your own (and I fear this might be me tonight), you can find a recipe over here at Japan Chan!